4:1 weight-reduction pulley system makes it much easier for one person to hoist their deer for cleaning, skinning, butchering, or cooling. The convenient carry bag will keep all the components and rope from getting tangled up and is great for off-season storage. The heavy-duty steel gambrel is built to last. The 3/8'' hanger is fully welded and gusseted for added strength. 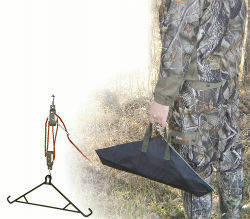 The special hook design makes the hanging of your deer or other large game an easier task. Rated at 500 lbs.